When I tell people I am a vegetarian, they assume that means Thanksgiving is no fun. Bah! Not true. Who needs turkey? Besides having a hoard of people by my side, which is really what Thanksgiving is about, I’ve got mashed potatoes, cranberry sauce, maple-roasted brussels sprouts, and this fantastic gluten free stuffing. And don’t forget the pecan pie. There’s always pecan pie. I have been a vegetarian most of my life, but for the short time I did eat turkey it was definitely not the focus of the meal for me. It’s always been about the sides. Why? The sides is where all the flavor is. The sides is where you get to have fun and experiment! Add some herbs to the cranberry sauce, add some maple syrup to the Brussels sprouts, add some truffle salt to the mashed potatoes (truffle salt makes me weak in the knees). Sides is where you get to mash the potatoes into the cranberry sauce with a dollop of stuffing and cram it all in your mouth in one joyous bite. Yeah. Sides are my kind of thing. Did you know that wild rice is not actually a grain, but a grass? So, those sensitive to grains can usually still eat wild rice and feel okay at the end of a meal. 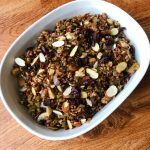 You can substitute all wild rice for the blend and you’ve got yourself a grain free stuffing as well. Look at that. This recipe has all the flavors of your traditional Thanksgiving stuffing without, well, all the stuff that makes you feel stuffed! 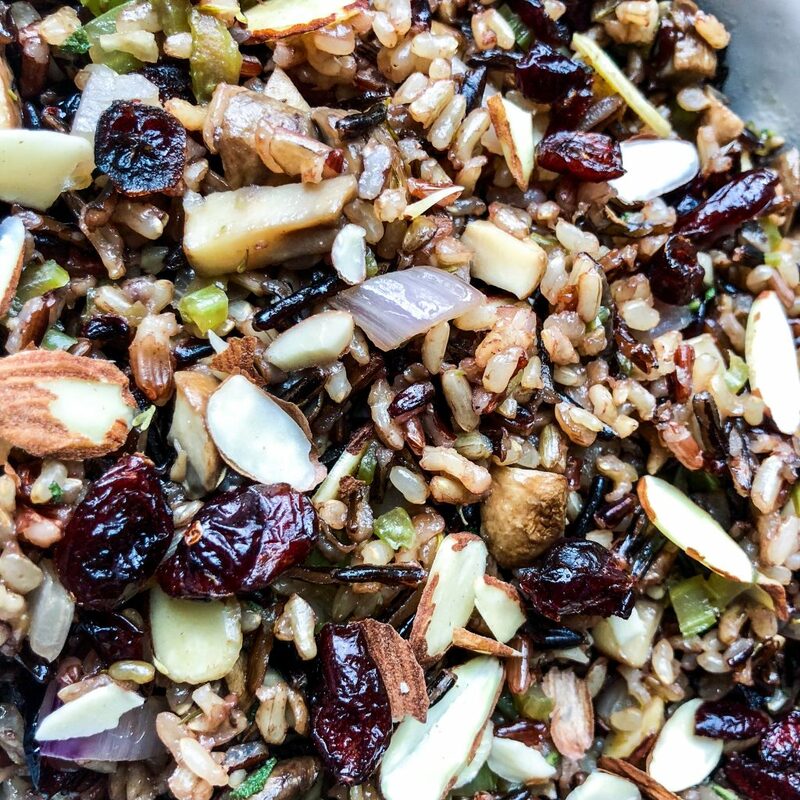 The almonds and celery add some crunch and the cranberries add enough sweetness and tart to give this dish a great depth. My husband, who loves Thanksgiving more than any meal of the year, said this was the best stuffing he’d ever eaten. What?! I hope you enjoy this gluten free stuffing as much as we do! In a medium saucepan, combine the wild rice blend, broth and bay leaf. Cover and bring to a boil. Reduce to a simmer and simmer for 40-45 minutes, or until rice is al dente (soft, but still slightly firm when bitten). Remove from the heat, allow to sit for 5 minutes, then fluff with a fork and set aside. Meanwhile, heat the olive oil over high heat in a large skillet. When the oil is shimmering add the shallot, mushrooms, celery and thyme and cook until shallot and celery have softened and the mushrooms have started releasing their juices, about 6-8 minutes. When most of the water from the mushrooms has evaporated, add the garlic and cook for 30 seconds, until fragrant. Remove from the heat and add the sage, almonds or sunflower seeds and cranberries. Add the wild rice and mix to thoroughly combine. Add salt and pepper to taste and enjoy! Make Ahead: Make as directed above and refrigerate up to two days. Reheat in a 300F oven for 10-15 minutes or until heated through. Variations: Switch up the fresh herbs and use thyme, oregano or tarragon. Use chopped, toasted pecans in place of the almonds.